HOW OFTEN SHOULD PRAIRIES BE BURNED? It’s a question prairie ecologists and managers have been wrestling with for many years. Unfortunately, research on the impacts of fire management is somewhat limited and often contradictory. Much of the best research has come from Konza Prairie in the flint hills of eastern Kansas, but many have rightly pointed out that translating flint hills research to other prairies – especially eastern tallgrass prairies – can be tricky. 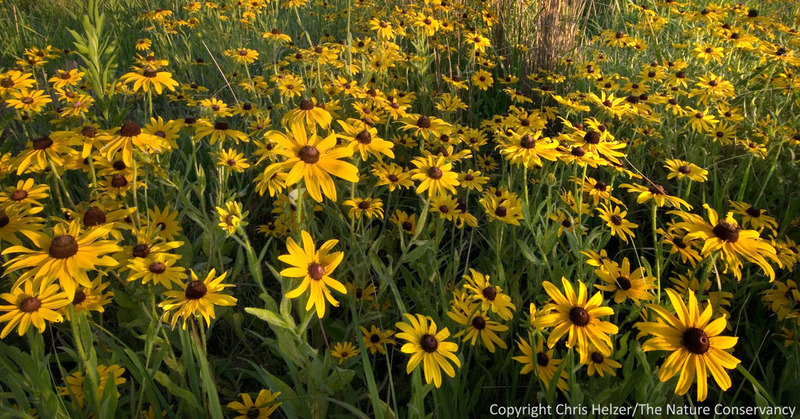 Prescribed is an important tool for prairie management, but how often should it be employed? At Konza and other western tallgrass prairie sites, frequent application of fire (in the absence of grazing) tends to increase the dominance of grasses, and decrease the abundance and diversity of wildflowers. However, prairie ecologists and managers working in eastern tallgrass prairies (particularly in Wisconsin and Illinois) point to numerous prairies that have been frequently burned for decades with no apparent loss of plant diversity. Those experts make strong arguments against applying western experience with frequent fire to eastern prairies. Unfortunately, the discussion has suffered from a scarcity of published long-term data from eastern prairies to help evaluate impacts of fire management there. Just last month, an excellent research paper by Marlin Bowles and Michael Jones helped fill that void. In 2001, Bowles inventoried the plant communities of 34 prairies around Chicago, Illinois – ranging from dry to wet-mesic sites – and compared those data to similar inventories conducted twenty five years earlier. The similarity in sampling methods between the two efforts allowed Bowles and Jones to look at how fire frequency affected changes in plant species composition over a significant period of time. In short, they found that a high fire frequency had a positive correlation with plant diversity. Using data from a series of 0.25m2 plots, Bowles and Jones analyzed changes in the average number of plant species (species richness) between the 1976 and 2001 data sets. Frequent burning increased species richness overall, but had a particularly positive impact on summer wildflower richness. Spring wildflowers, warm-season grasses, and legumes didn’t necessarily increase in species richness with higher fire frequency, but strongly decreased in richness within prairies that were not burned very often. The authors speculated that the greatest impact of burning on plant species richness was likely the removal of detritus (previous years’ vegetation), which can greatly reduce the amount of light available to growing plants and also change microclimatic conditions and nutrient availability. Because eastern tallgrass prairies receive more rainfall than do western prairies, they produce more plant biomass each year. Bowles and Jones pointed to that increased biomass production as a probable reason that frequent fires have such a strong positive impact on plant diversity in eastern prairies. The contrast in response to frequent fire between western and eastern tallgrass prairies is intriguing, and it’s great to have published long-term data to help quantify it. It may be that increased vegetative growth due to higher rainfall in the east is largely responsible for the difference, but surely the story is more complicated than that. It will probably take quite a bit more research across the entire east-west continuum of tallgrass prairies before we really understand what’s going on. Prairies like this one in the flint hills of Kansas respond differently to fire and other management treatments than do prairies further east. However, other variables (latitude, soil type, topography, land use history, and more) all influence management responses as well. While I thought the paper by Bowles and Jones was very well done, two thoughts occurred to me as I read it. I will deal with each only briefly now, but will flesh them out more in future posts. I think both are important to consider before entering into a management regime dominated by frequent burning. First, Bowles and Jones emphasized the importance of frequent fire as a “stabilizing force” in tallgrass prairie plant communities. In other words, they inferred that good management should result in a plant community that changes little from year to year. They called these stable plant communities “late-successional,” a term that I have a difficult time applying to prairies, which require frequent disturbances to keep from becoming woodlands. Regardless of terminology, however, the question of whether or not prairies should have stable plant communities is an interesting one. I’ve argued in the past that healthy prairie plant communities should look different each year (see, for example, my post on “Calendar Prairies”.) However, most of my experience comes from more western prairies, so I have an admitted bias. Still, it worries me to have a management regime that always favors the same species year after year, because other species are – by default – being perennially managed against. Reducing the overall pool of species in a prairie seems potentially risky, but I don’t know how serious that risk might be. Second (but related to the first), arguments for frequent fire tend to focus primarily on plant diversity rather than the overall diversity of the prairie community, including both vertebrate and invertebrate animals – not to mention fungi, bacteria, and other organisms. Fire can have serious negative implications for some of those other residents, especially when small isolated prairies are burned in their entirety, leaving no unburned refuges for vulnerable species. Insects that overwinter in the stems of plants, for example, are particularly vulnerable to spring fires. The dramatic change to habitat structure wrought by fire can also have big impacts on vertebrates (as well as invertebrates) that require thatchy cover for survival. As I mentioned above, reducing the pool of species in a prairie (plant, animal, or otherwise) may have serious implications for the overall health of the prairie – especially in fragmented landscapes where species are unlikely to recolonize areas from which they are eliminated. 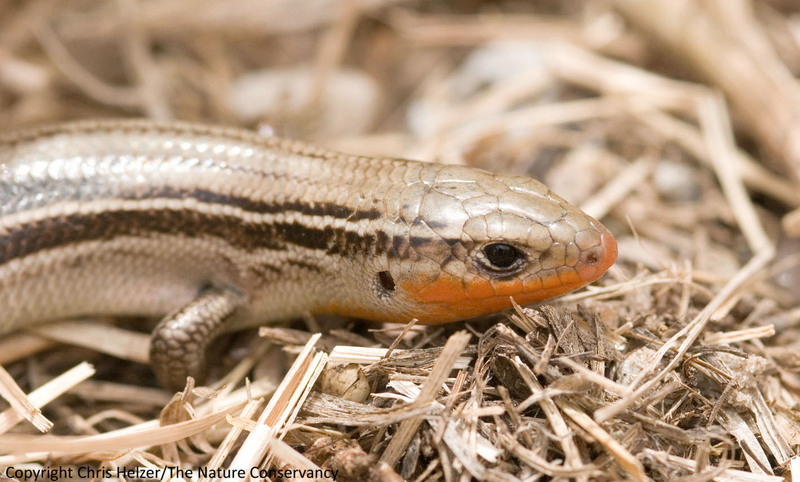 I generally find prairie skinks such as this one in prairies with a certain amount of thatch. I’m not sure how this or other thatch-dependent species would do in frequently burned prairies. I tend to favor prairie management that provides multiple habitat types and growing conditions each year, and shifts the locations of those around the prairie from year to year. That kind of mixed and dynamic management should help ensure that animal species can always find a place to live within a prairie, and that every plant species will have positive growing conditions at least every few years. However, I’m making some big assumptions about the importance of that philosophy, and I’m certainly not advocating that every prairie should be managed that way – especially very small prairies for which subdivision of management may not even be feasible. Saying that prairies are incredibly complex and difficult to understand is an understatement. I think our prairie management should account for that complexity. Good managers carefully evaluate the responses of their prairies to management, and adjust accordingly. The Bowles and Jones study helps us better understand the way prairies respond to management, but also highlights the danger of simply applying what works in some prairies to others. Their paper focuses on differences between east and west, but regardless of geographic location, soil type, size, or degree of isolation, every prairie needs (and deserves!) management that is custom tailored. This entry was posted in Prairie Animals, Prairie Insects, Prairie Management, Prairie Natural History, Prairie Plants and tagged bowles and jones 2013, burning, controlled burn, eastern tallgrass prairie, fire frequency, frequency, grassland, how often prairie fire, how often should prairies burn, konza prairie, marlin bowles, prairie, prairie management, prescribed fire, repeated burning, research, tallgrass prairie by Chris Helzer. Bookmark the permalink. Removal of the litter from the previous year is the key for most species. We have learned the lesson of leaving the old dead material from the previous year in our seed production plots the hard way. Disease, pests persist well in the old dead vegetation, but remove it by burning or haying and the disease and pest issues are reduced greatly. I am sure the same happens in a prairie that is not burned or hayed, many of the plants are reduced by the influx of disease and pests. Some species are more susceptible to disease/pests and are removed from the system earlier. Legumes and fire go hand in hand??? That is one of the ways that legume seed is scarified, by burning. Thus burn years should have greater amounts of legumes, especially small new recruits. The number of flowering plants may not be seen for a couple of years after the fire. The one thing I can say is that your system of grazing prairie creates more of a patchy burn than a prairie that fire only is utilized. One tool we have used to reduce some of the grass in our reconstructed prairies is spray a grass selective herbicide. This has caused a patchy burn this spring especially with the cool damp spring we are having. I am sure you see the same thing with your areas that have been grazed-patchy burns in the grazed areas. So there is a change in effects with combinations of management. Stable system is what is great about prairie. It is not seeing the same prairie picture annually, but to have a system that is resilient to change. This could be seen last year with the hot-dry summer we had. The prairie is still there, but some species were greatly reduced, while others flourished. Compass plant, Lead plant, and Round headed bushclover were bountiful during last years hot dry summer. For example, previous to last year only one Compass plant had flowered in our 10 year old reconstruction, last summer we had 25 or more flowering plants. Thanks for your blog. I try to read it often! Thanks Bill – the drought last summer was interesting here too. Definitely nice to see plant species that can step up their game in dry years. Bill, I have seen forb diversity (including legumes) significantly reduced after a burn. This observation was at a prairie restoration in the Chicago area. My observations paralleled those of researchers at Konza. I will have to look through Mr. Bowles and Mr. Jones paper before I can comment. I think in local remnants higher fire frequency does result in more diversity. I have no explanation for why fire would act differently in a remnant than in a restoration. The answer probably relates to the higher complexity of the biological system in remnants. As you know I burned our 2010 seeded 1 acre prairie for the first time about a month ago. As I walked it over the weekend I noticed many areas have an abundance of seedlings and my first guess was black-eyed susans. Now after getting down into the low 20’s Saturday morning we’ll see how they do. My short experience shows prairie plants are tougher than I originally thought. As I was walking the prairie I was wondering if a late fall dormant seeding followed by an early spring burning would be good to add forb diversity? Originally I thought it would be a bad idea to seed the fall before a spring burn, but after seeing all the seedlings I have now and clean ground, thinking it might be a good thing. Ideally the seeds would work into the soil over winter and not be damaged by the fire. What are your thoughts on this? You don’t have to worry about toughness in your prairie plants. The question about whether or not to see prior to a burn is one I’ve had a lot, but have never studied. I don’t know of anyone who’s tested it, which seems silly, so hopefully someone has and I just haven’t heard about it. My GUESS is that most species would come through the fire ok – especially if you seeded in the fall and burned in the spring because – as you said, some of those seeds would get low in the thatch. Probably the fluffier seeds would be the most vulnerable to damage from the fire – and would be the least likely to make it through the thatch to the ground prior to the fire too. Anyone else ever tried it? “How often should I burn?” is a question I’ve gotten more than a handful of times when talking with landowners about doing prescribed burning on their land, be it restoration or range management. While we currently have some good ideas about historical fire frequency in regards to natural lands management, we don’t have a sure-fire answer, and I’m not sure we’re really supposed to. Fire has always been and always will be highly variable in time and space (past, present, and future), even with human application. I found your question of the term “late successional” being applied to prairies an interesting one. In part, I think this term is used frequently in eastern portions of the tallgrass prairie and doesn’t seem to be used as much (at least here in Missouri). But, I think your question reflects some sort of thought-shift from east to west, as well. I wonder if most would agree that tallgrass prairie represents a climax community? To me, the fact that prairies need disturbance to be maintained doesn’t suggest that they can’t be a stable climax plant community that persists in a location for thousands (or more) of years. Even climax communities, such as Oak-Hickory forests, require some level of disturbance for maintenance. Rather, I think that woodlands represent an alternative stable state for the same location where a prairie might occur, and that the frequency of disturbance (among other things) helps to shape whether spot X is prairie or wooded. Another way that I have thought about early versus late successional communities is in the context of restoration. We all know that there are some species of prairie plants that are characteristic to remnants that simply do not establish well (or at all) in prairie restorations, while others, thrive 1-5 years post-planting. In my mind, the plants that do not establish well represent the end of the successional continuum, in terms of prairie development, so I would be comfortable calling those species “late successional”. These are just a few quick thoughts, but I’d be very interested to see what others in this community think about whether prairies are late successional communities or not. My management philosophy seems to be quite similar to yours. I believe that variability is critical, and you hinted at this toward the end of your post (“mixed and dynamic management”). Not only is it important to vary the location of burned patches, but it is equally important to vary the frequency and seasonality of fire. Spring, summer, and fall fire will all suppress or promote a different suite of species. Similarly, varying the frequency will produce a range of structural conditions and species assemblages. I have found that as I have gotten older, I have become more conservative in use of fire. Perhaps it is not just that I am older, but more knowledgeable in what doesn’t benefit or is adversely affected by a burn, such as insects or eggs in stems, grassland wildlife that need unburned areas in which to nest, grazers that need old growth (carbohydrates) to mix with high protein new growth, and how grazers attracted to burns affected the extent, intensity and frequency of burns. I now view tall flames and uniformly black landscapes as the exception to the historical norm. Even if Indian fire was frequent, it was more a slow-moving, meandering burn than the high-flame head fires we like to use, resulting in different effects and responses. On the matter of whether prairie is climax, it is not, but a disclimax community maintained by fire, herbivory, and probably historically by Man’s use of trees, saplings and shrubs for housing (bark and longhouse frames, fuel, medicines, etc. until the introduction of European diseases and the EuroAsians themselves. Burn frequency / season preferences come back to the goals for the site. If it’s diversity (and shouldn’t it always be? ), then the management, fire plus other tools, must be varied. Three interesting things about the Konza experiments are how long-term they are, that each large plot has been consistently managed from the start, and especially that the various treatments are on contiguous parts of the same landscape (geology, watershed, history before protection), thus leading to a better understanding of management effects without so much complication from site variation as in the Chicago area study. Volumes could be written about Konza Prairie ecology and natural history, and should be. There is a book, and of course journal articles, but there is so much more hiding in unpublished dissertations and field notes. On a smaller scale, you perhaps have an opportunity in the central Platte prairies to do a contrasting study, again in essentialy one landscape (though more broken up) in which the management regimen is varied over the years rather than by place. By the way, if you want to see some stunning photography, and a bit of text, and even hear some gentle music inspired by the beautiful nature of Wales, check out previous commenter Mike Howe’s website by clicking on his name.